More travel but if you're not interested don't read further. 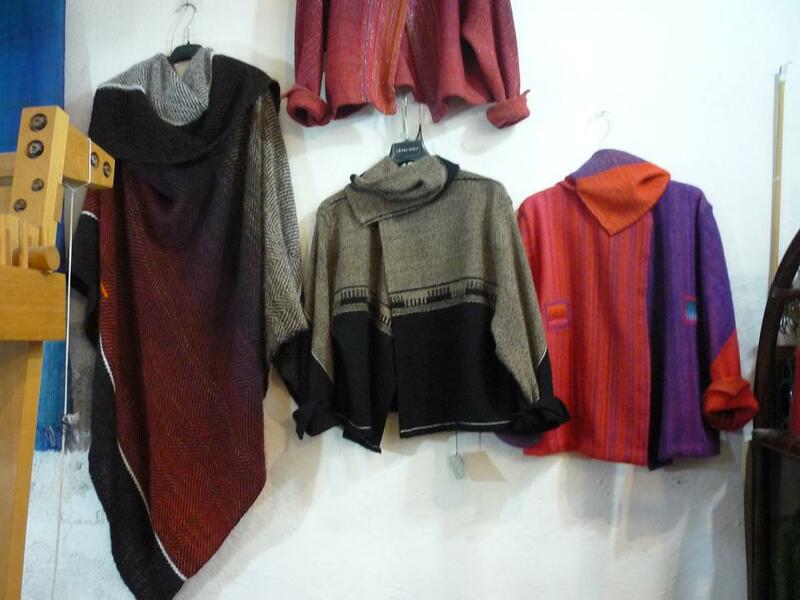 There will be weaving soon. 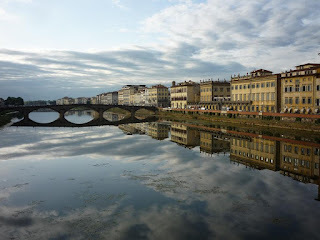 Before leaving Padua for Florence Peter told me "This train will go like stink!" I knitted all the way to Bolognia but we didn't go too fast as several stops but from Bolognia onwards we travelled mostly through tunnels (in Italy if there's a valley you build a bridge, if a hill you tunnel it) and I couldn't see very well so was watching a tv screen and saw 250kph, oh I thought, 260, 270, hmm this guys going for a record. At 300kph I felt like I'd end up in Hobitville. For forty years we've had a hand watercolour etching of the Ponte a Santa Trinita with Ponte Vecchio in the background over the Arno River in Florence on our lounge wall and now I've walked over both bridges (several times). 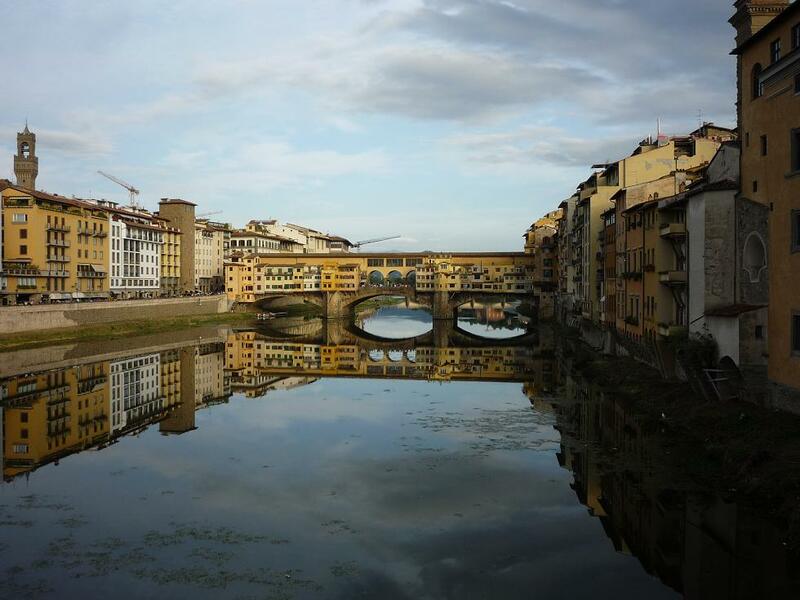 Since the 13th century the Ponte Vecchio has had shops lining its sides. It used to house all types of merchants including butchers, fishmongers and tanners causing a right old stink. In 1593 Ferdinand I decreed that only goldsmiths and jewellers could trade and that is who is there today (no I wasn't tempted). During World War 2 Vecchio was the only bridge in Florence over the Arno not destroyed by fleeing Germans. Instead they destroyed the buildings at both ends. 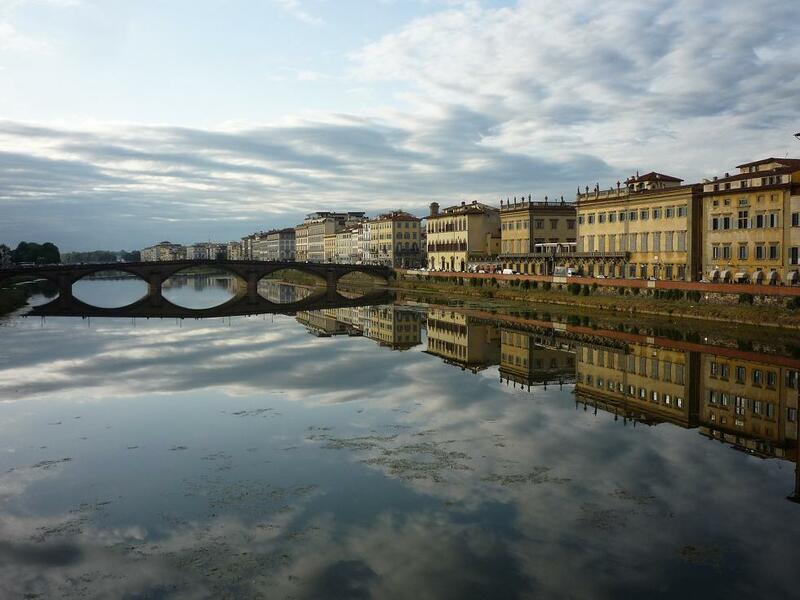 The Ponte a Santa Trinita was rebuilt using as much original stone as possible. 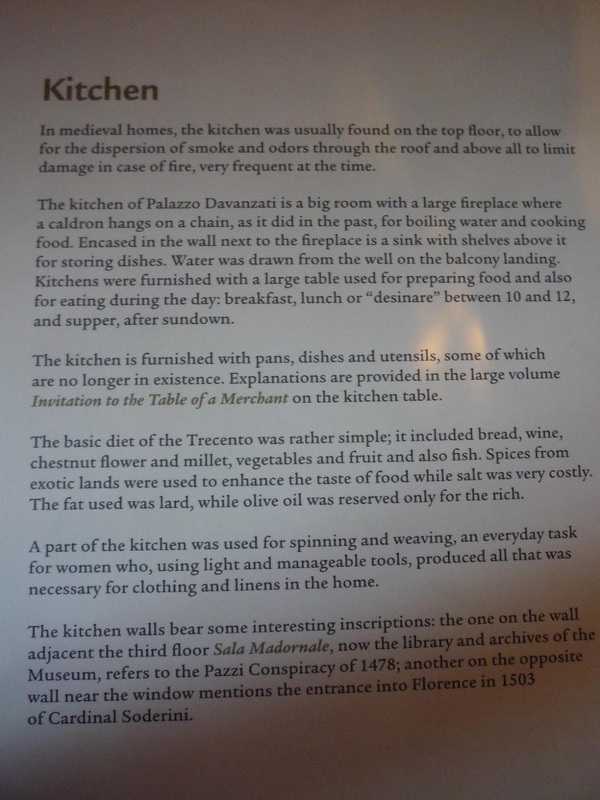 We spent a morning in the Museo di Palazzo Davanzati, a Renaissance style palace built in the 14th century. 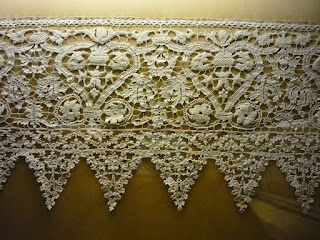 One floor was almost entirely displaying very fine lace and embroidery. 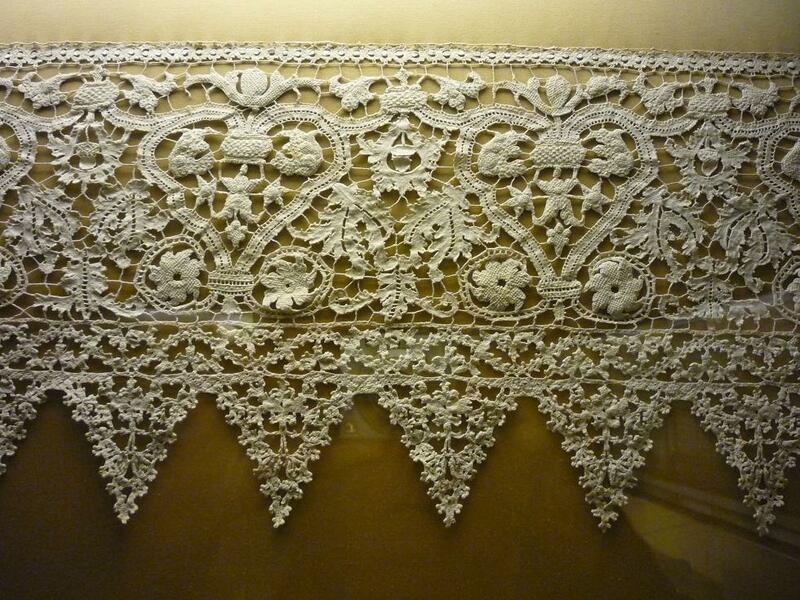 This needle lace is 17th century - Reticello flounce. I think if you enlarge this you will be able to read it. 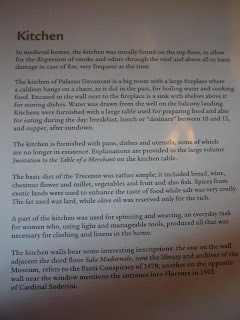 The kitchen was very large but I imagine there would have been a huge work table and other things to fill it. In the distance, under the window, is a weaving loom. 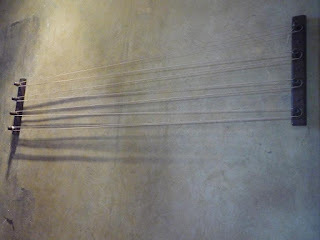 The warping board was attached to the wall but displayed pretty high up to be used conveniently so suspect this wouldn't have been its original home. 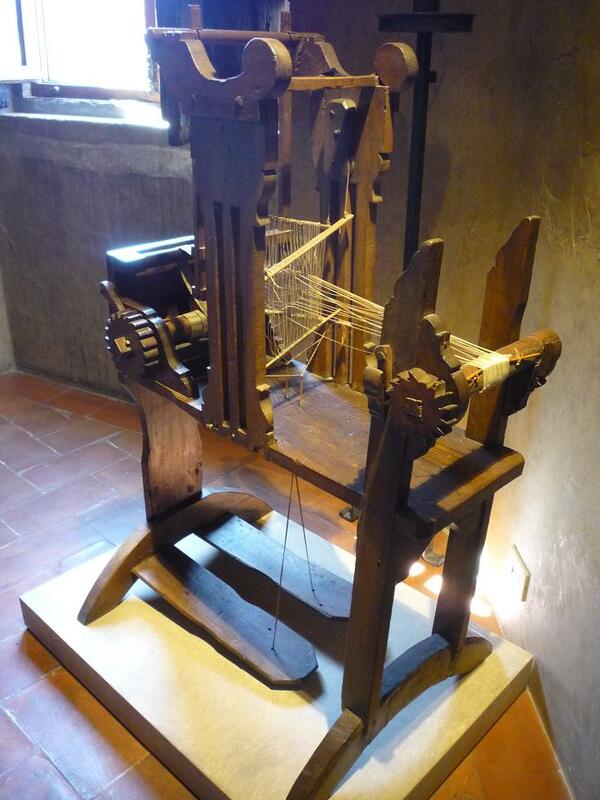 Now look at this 16th century loom. I imagine the weaver would straddle the upright to work the pedals? 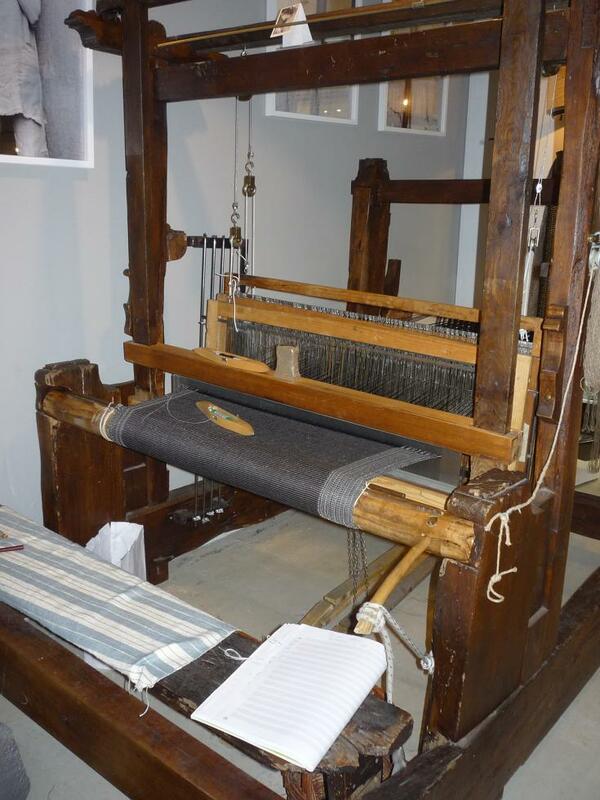 The beater and weaving are at the upright end of the loom and the fabric goes down through the slot so one isn't leaning on it. 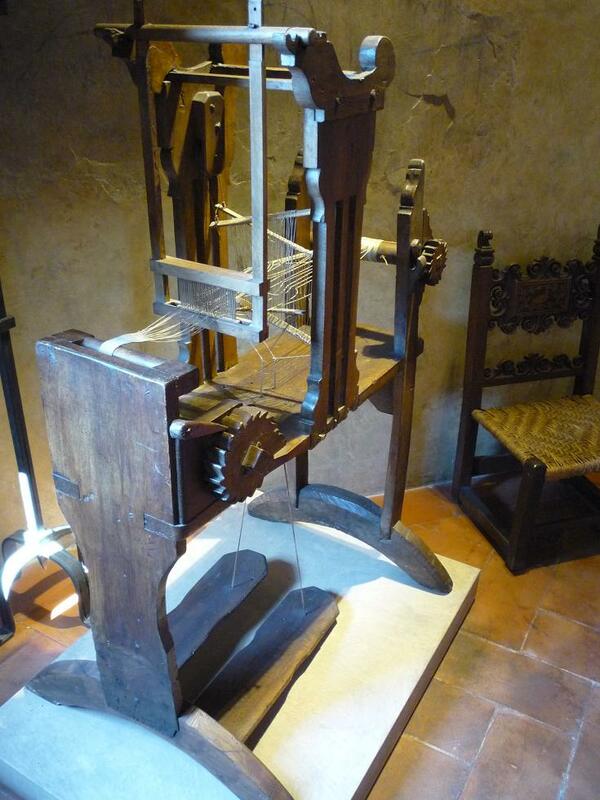 Doesn't seem to be very comfortable to use but a very nicely built loom with pawl and ratchet and decorated parts. 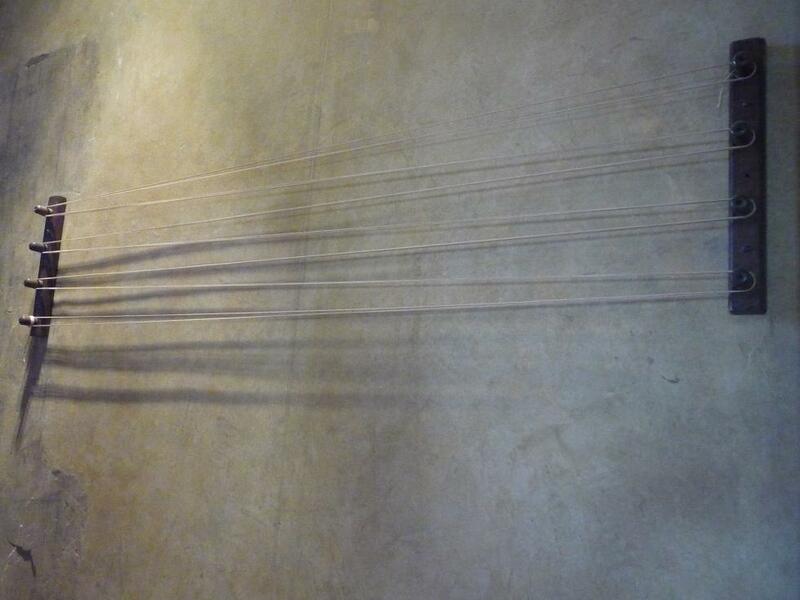 Or has it been put together with the castle facing the wrong way? 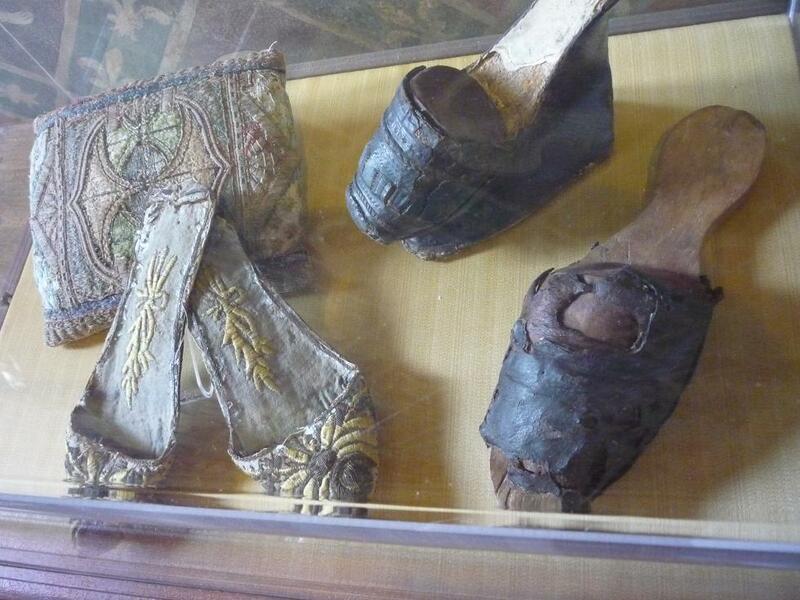 And this generation thinks they invented platform shoes! At the Palazzo Vecchio I couldn't resist recording this ceiling painting of Penelope at the loom. 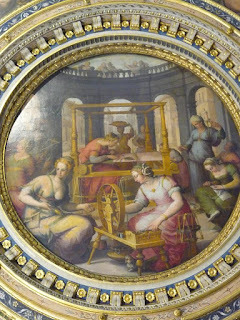 The poet Homer tells us in the Odysey that during the long voyage of Penelope's husband Ulysses, King of Ithaca, the queen managed to avoid remarrying by postponing her choice of suitor until she had finished a piece of cloth which she wove during the day and unravelled at night. Then it was back on another train to the Chinque Terre coast, five villages with what should be walking trails between each. 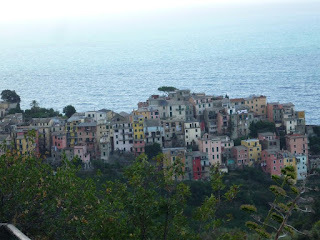 Unfortunately the trails between the first two villages had been damaged by slips but we were staying at the third village Corniglia. One morning I pulled the curtains to see a guy shifting crates of grapes downstairs to a small room beside our apartment. 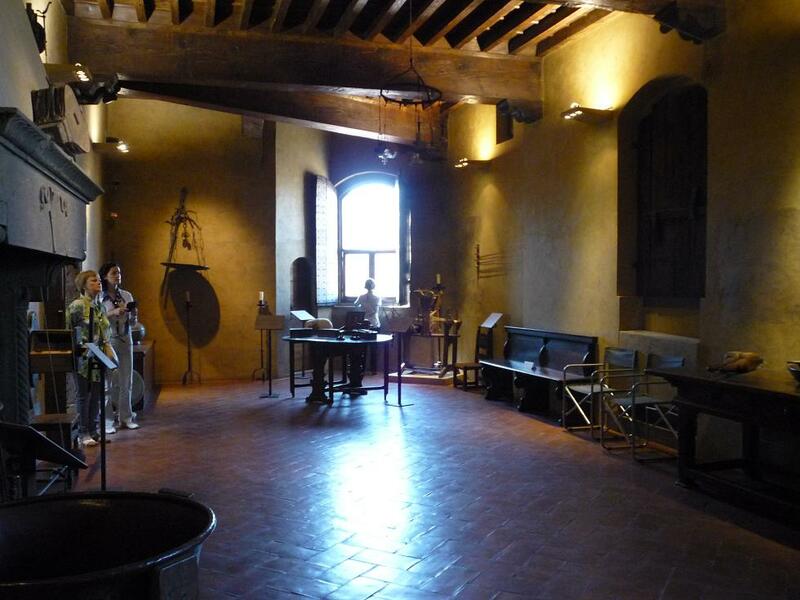 I investigated further to find it was a winery with grapes being processed by a press and one guy stamping the grapes in another vat. It was so hot I can tell you it was more than grape juice going into that wine! 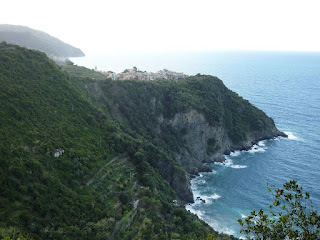 Walking the trail to village 4, Vernazza, looking back to Corniglia and Manarola. 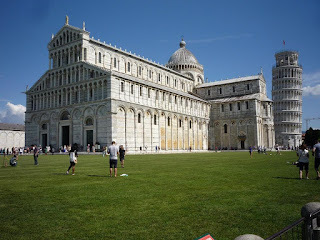 On the move again heading towards Lucca with a day visit to Pisa. I never realised before that the leaning tower was actually the bell tower for the cathedral. Lucca was gloriously flat. So easy to walk around and somehow the authorities are able to keep the illegal immigrants out which made it so much pleasanter. I make no bones about it, these people target tourists and make travel so unpleasant. Solidly built loom, heavy beater. 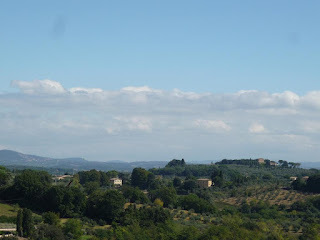 Siena is the opposite of Lucca in that it is VERY hilly; even the so called flat streets on the ridges of the hills are still not level. By this time we had been on the move for five weeks and I was pretty fit. Spent quite a while outside the Cathedral waiting for a bride to arrive and the wedding party to enter. Next day we walked outside the city walls and returned to our apartment via a church we wanted to see. "We can't go in there, its a funeral" I said. 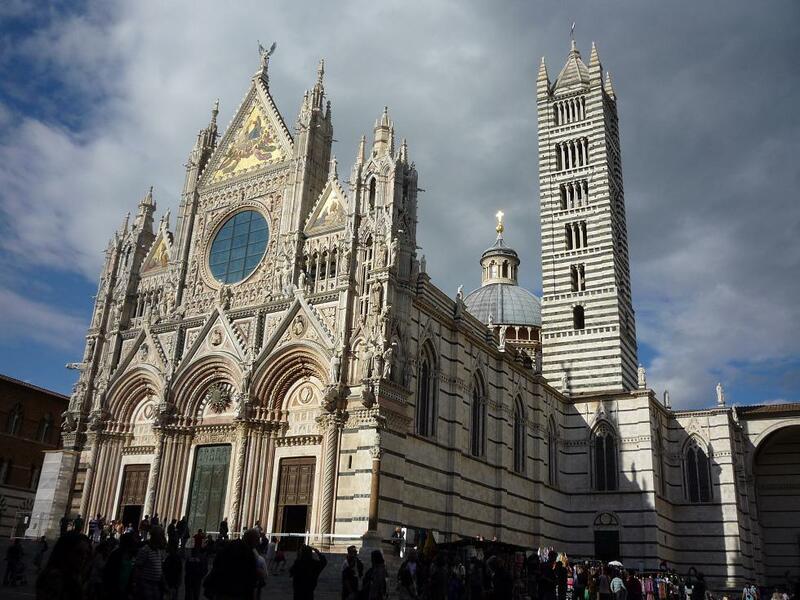 The centre of Siena is the Piazza del Campo, a fan shaped oval sloping down to a central point. 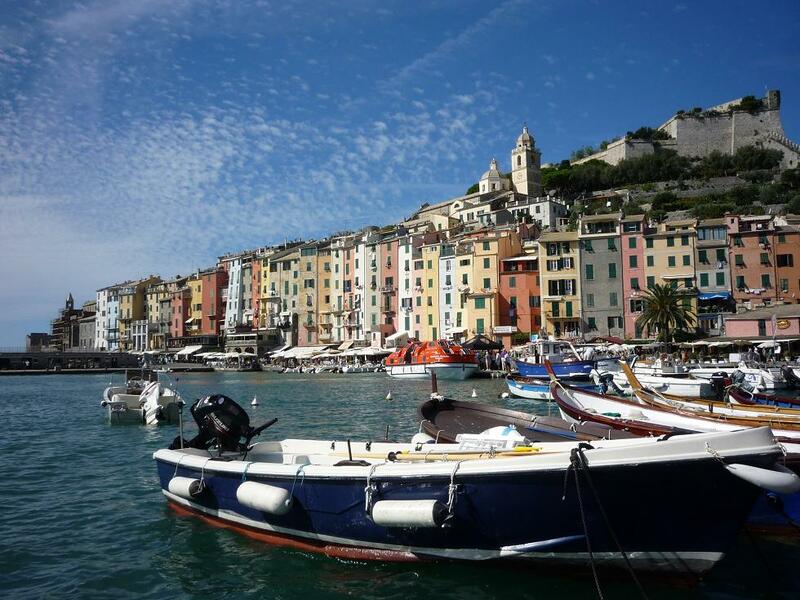 I think I'm right in saying once a year the contrade hold horse races around the Piazza. 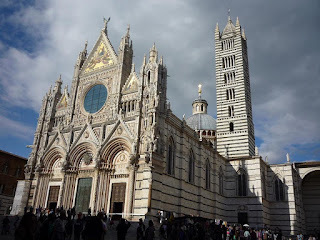 We spent several hours in the Piazza in the small hours of one morning hoping to see the eclipse of the moon but unfortunately it was too cloudy. 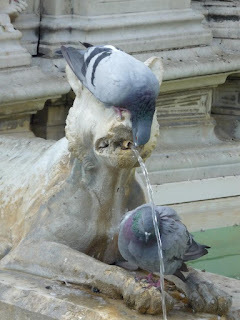 I was fascinated by how these pigeons had adapted at the Fonte Gaia, a fountain on the top part of the Piazza del Campo. 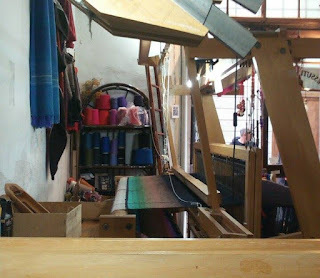 While in Siena I met Fioretta Bacci in her small but wonderful weaving laboratorio. I love the way she blends her colours. By now it was about seven weeks since I'd sat at my loom so probably looked a bit strange caressing Fiore's loom. She was so busy with customers I think she would have employed me! 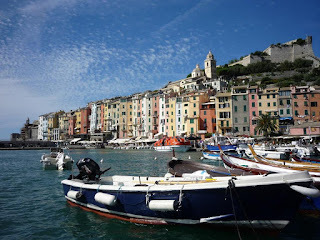 Next time, the moment all Italians should dread, the Dudfields hire a car.